On the afternoon of December 29, the last working day of 2017, Lu Yong, CEO and Founder of Evergreen Asia Advisors, a special research fellow of China and the globalization think-tank and representative in New York, was invited to share her observations and reflections on the current situation of the American public welfare industry in the Shanghai Soong Ching Ling Foundation. As one of those rare people who were born and grew up in China, but have extensive research and management experience at leading American think tanks and nonprofit organizations, Ms. Lu Yong has a unique analysis and insights into the market-oriented operations of American public institutions and the latest trends in foundation operations, fund-raising strategies and the development of work in the field of children. 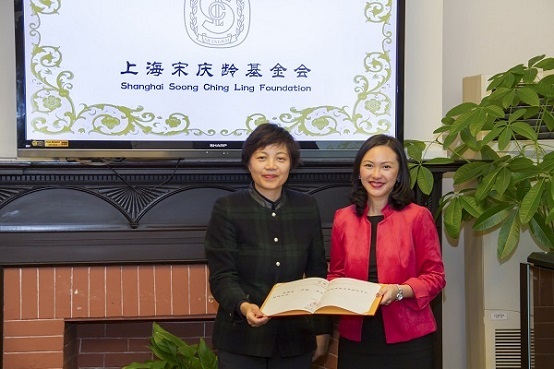 Prior to the sharing meeting, the Shanghai Soong Ching Ling Foundation presented to Ms. Lu Yong the certificate of a distinguished strategic development expert. Shanghai Soong Ching Ling Foundation leaders, staff and its special fund leaders attended the meeting and raised hot issues to discuss and exchange with Ms. Lu Yong.